We make basic basil pesto and sun-dried tomato pesto with our homegrown basil, but you can also use purchased pesto. Just toss with the cooked orzo, tomatoes, and kalamata olives, sprinkle a little Parmesan on top, and it’s ready to serve. It’s delicious warm or cold as a side salad. Bring about 1-1/2 quarts of water to boil in the pot. Add pinch of salt and the orzo and cook until al dente, about 9 minutes. Drain well in the mesh strainer, then transfer hot orzo to the large bowl. 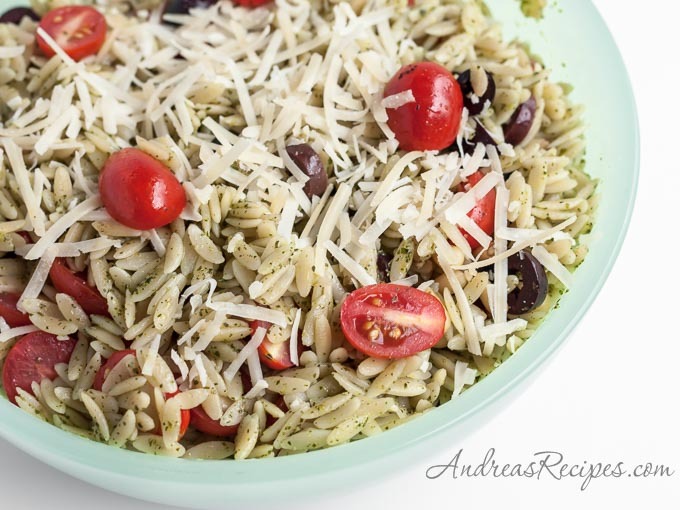 Toss the hot orzo with the pesto, then it allow to cool to room temperature, about 30 minutes. Toss in the chopped olives, halved tomatoes, and the pine nuts. Sprinkle on a little fresh ground black pepper and some fresh grated Parmesan cheese, and then serve. Make ahead the pasta and chill it overnight for quick prep on the day you serve. I just made two different salads with orzo this week…I am on an orzo kick…will have to try yours.